Full Belly Farm has enjoyed abundant harvests lately. 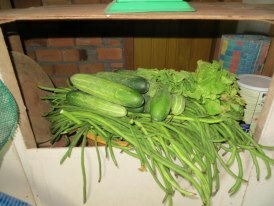 Apart from the usual long beans and leafy greens, we have been experimenting with gourd and eggplant with great success! The chickens are breeding well and enjoying a special vegie patch in their coop for them to feast on once the vegies have grown. A lot of work has been done by volunteers on flood mitigation work by securing the beds with retaining walls and we will certainly notice the difference when wet season has finished and our beds have not washed away. But by far the most exciting outcome has been the first harvests of fish! The tilapia and ch’pin have been steadily growing over the last 6 months - as we ironed out some minor problems - and now they are being served up as part of the Breakfast Club meal twice a week. 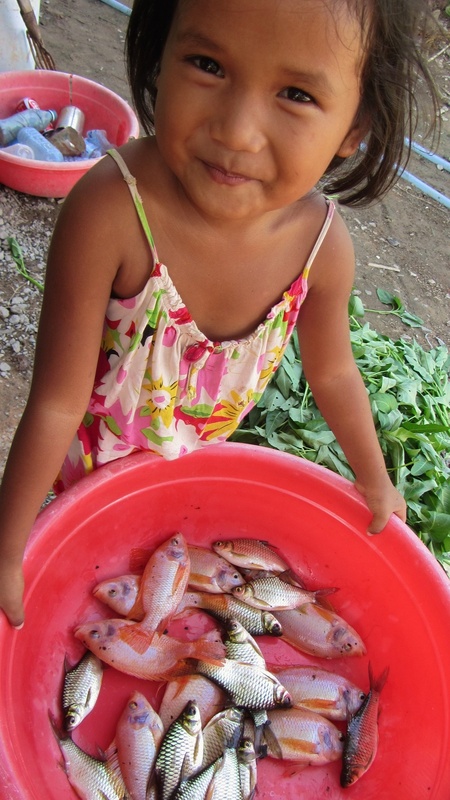 The children especially love Fish Bobo – Khmer rice porridge cooked with pak choy and morning glory from the farm. A highly nutritious and exceptionally delicious way to start the day. Over the wall the farm is developing rapidly. The poor soil has been enriched with compost and lots of various veggies planted. So far there are mung beans, cucumbers, morning glory, spring onions, kale, lettuce and corn! There are 2 banana circles with banana plants on the outer ring and all sorts of other plants, such as ginger, growing inside. The speed of growth is phenomenal, and Jack Howard, Son Chea, and the forever smiling Mr Ty are working exceptionally hard to move towards our goal of producing as much of the food we need for Breakfast Club as possible. With the food bill (excluding rice) running at some $250 per month (excluding rice), this has the potential to eliviate food costs in the future. The next step is ducks and chickens, as well as preparing the fish ponds for the farming of tilapia, hopefully in the first few months of 2013. Continuing our involvement with the soccer league run by Globalteer, we were lucky enough to be have a family of soccer-mad volunteers. After seeing the ABCs and Rice teams play on a weekend they noticed we were one of the few teams taking part that did not have enough uniforms to kit out the whole team, and so they decided to donate football uniforms for ALL of teams!, (a very generous 48 strips). The teams have worn them in competition already and our players can’t possibly be missed now in their VERY bright green shirts and shorts. Our sincere thanks go to David Carrington and his wife Barbara, and soccer playing daughters Lara and Maya. They will really look the part when the tournament kicks off properly in December. This month’s Shining Stars goes to the parents of one of our long-term volunteers, Rachel Woodgate. Lynn Blades and David Holmes held a fundraising barbeque at their home near Melbourne in Australia, running a silent auction and offering other goods for sale. They raised just a few dollars short of $1,500, a fantastic total, and our sincere thanks go to them and all of their friends who made it such a success. Having extended the new toilet/kitchen building, ABC’s and Rice now has a workshop to be proud of. It was put together by Peter Raynes and fitted out with all types of tools, mostly through generous donations and some brought over from various countries, incurring serious excess baggage charges! Our thanks go to those of you who donated tools. The workshop is already in operation, with courses running to train the seniors in basic woodworking skills, with an emphasis on safety. So far each student has made a very sturdy and practical stool, which they have proudly taken home already. The seniors also assisted Pete with the construction of a picnic table now in place near the kitchen to allow the Breakfast Club kids to eat their meals properly, and this is the first of 4 planned tables. La, a note to follow SEW! Adding to the current vocational studies of computer skills, paper making and basic woodworking, we are now the proud owners of 2 treadle sewing machines, kindly donated by Vivian Griffin who is volunteering with us for 3 months. Viv has already started instruction on the sewing machines and is recycling old rice bags for the training, turning them into trendy, new school bags! Over the last month, as school days get busier and busier with a new emphasis on vocational classes and sports (in partnership with the Globalteer Sports Team), some of the team along with volunteers, have been organizing working bees on weekends to address a few tasks that needed a focus to get them completed. The first one was to try to clear the area designated for sports in front of the new toilet/kitchen/Imagination Station building (see next newsletter for news on this exciting development). It was a bit overgrown and could get waterlogged in places so a clearance was carried out along with the dumping of many loads of sand onto the biggest puddles. 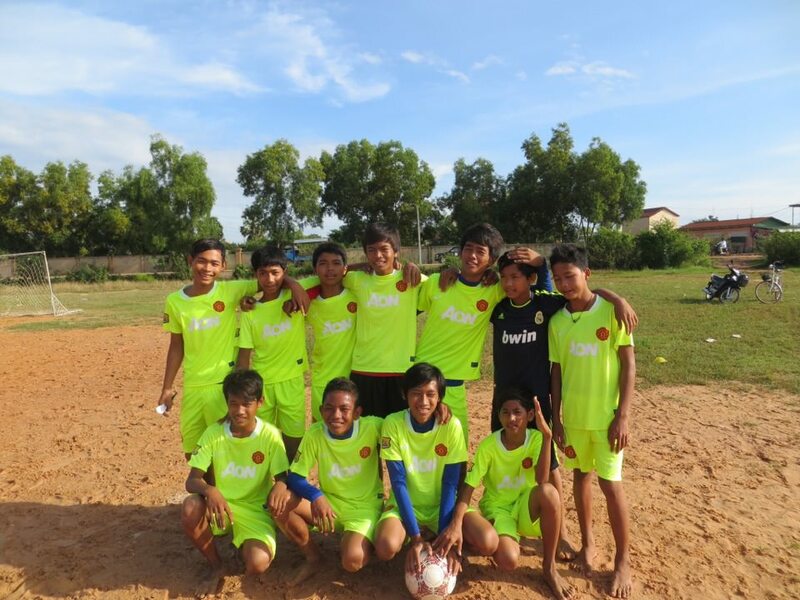 As long as we don’t get excessive rain the area can now be used when the Globalteer Sports Team turn up twice a week for training sessions in advance of the inter-NGO football league which is due to take place later this year. The next working bees were to try to commission the new Imagination Station. In ABCs and Rice the largest class is the Monkey Room, the younger students who number around 25 in both the morning and afternoon classes. The plan is to take some of the youngest students into a new breakaway group, called the Meerkats, and focus more on early learning skills with them, leaving the monkeys at a more manageable size. Again some of the team has been in on the weekends painting the murals on the walls, and getting the new room ready for use. It is almost ready now, just waiting on the final coats of paint drying and so by the time we issue the October newsletter, it should be in operation. Thanks to everyone for this fantastic effort! Thanks to our gorgeous volunteer Jay Francis, a new craze that could become bigger than Angry Birds, is sweeping ABCs and Rice – knitting! Using improvised knitting needles from sharpened chopsticks Jay introduced basic skills to her class. Word soon got around and it has now gone ‘viral’ with all but our youngest kids now knitting feverishly, and it’s not just the girls. It’s become not just a favourite for the crafts classes, but they can be seen knitting now during breaks. It has the added advantage of silence that comes with their concentration. Jay is here until 8th November but as our ‘crafty’ teacher Theavy has really picked it up, it looks like knitting could become a standard vocational skill at the school. This is a perfect example of the sometimes-surprising result of a volunteer trying something out for the first time, and turning it into a successful and enjoyable hobby for the children. This month’s choice of the ABCs and Rice Shining Star Award was an easy one to make, due to the amazing efforts of the employees at the John Holland construction project at Joondalup Health Campus Redevelopment in Perth, Western Australia. The catalyst for this was from 2 of our amazing volunteers, Andrew Crew, who works for John Holland, and his partner Jacqueline Joschonek, who were both with us recently for about 2 months. Quite often we have volunteers who return home and are inspired to try some fundraising, but unusually all of this effort was done while Andrew and Jackie were still with us in Cambodia. A raffle was organized with such fantastic prizes of top quality power tools, tools and accessories that they raised an incredible $8000 at $5 a ticket! A huge thank you goes to Jay Whitman, project manager, as well as Stefanie, Suzie, Rhonda and Joshua of John Holland as well as everyone who sold or bought tickets. The really fantastic prizes were donated by very generous subcontractors which included Nilsen Electrical, Combined Painting, Centrigrade, Leisk Plumbing, Systek, CWC, Protection Engineering, Siganto and Stacey, Tubelok, Jupps Flooring, Focus Demolition, Bestbar, Downer EDI, Cooke and Dowsett, Bravo, Elcord, H'Var, Antry Cabinetry, Danica, Law Bricklaying and Ramsay Healthcare. Thanks to frequent posts, photos and videos during their work at ABCs and Rice, Andrew’s colleagues were so inspired by their work with us, and stories of our amazing kids that they wanted to help. Our thanks to everyone who put this together and contributed to what is a major fundraising effort, as well as to Andrew and Jackie who are still greatly missed by staff and children alike, especially by all of us Justin Bieber fans! These funds have allowed us to move forward on many projects including Full Belly Farm; Watch out for our next newsletter.